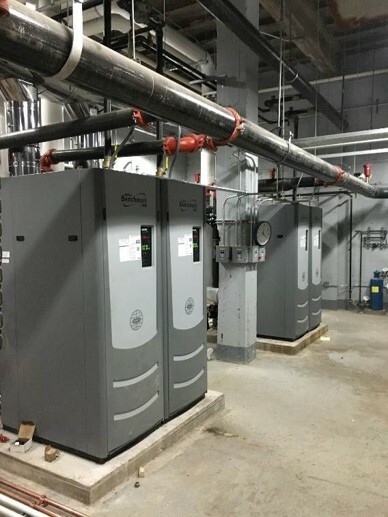 EI Associates is presently assisting the South Orange and Maplewood School District with converting an aged and inefficient steam heating system with a new, high-performance condensing hot water heating system serving over 100,000 sq.ft. of the original 1928 Wing ‘A’ of Columbia High School. Integrating modern systems within the iconic American gothic masonry structure proved challenging. The project required careful planning, design and engineering efforts to properly locate all new heating system equipment, piping and components, address the abatement of asbestos plaster within the walls and ceilings and VAT floor tile, minimize the impact to the existing architecture and ensure improved comfort and energy efficiency of the new system. The project was designed and is presently being constructed in a phased manner to accommodate the requirement for limited area abatement of affected wall, floor and ceiling areas over two summers. The core purpose of retrofitting this historic building with upgraded mechanical systems is human comfort and health. 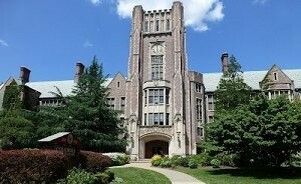 The existing steam heating system proved difficult to control, inefficient and provided uncomfortable environmental conditions for the faculty and students. 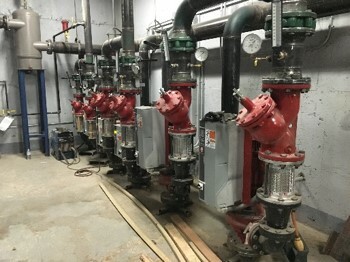 The new mechanical system, scheduled to be fully operational by September 2016, will consist of 6 modular, high-performance condensing hot water boilers, new hot water piping to new unit ventilators and radiant heating within all Wing ‘A’ areas and new DDC controls and will provide for increased control, comfort and energy efficiency. Approved under Round 4 of the NJ Regular Operating District Grant Program, 40% of the project cost will be funded by the state. This offset of initial project costs coupled with future energy savings and improved comfort conditions make this a “win-win” proposition for the district. In addition, the smaller footprint of the new boiler equipment will allow the repurpose of former mechanical areas for much needed storage space.